University of Leeds with STFC Rutherford Appleton Laboratory and StarDundee Ltd.
Advances in satellite remote-sensing measurements of the constituents of the atmosphere have substantially increased our knowledge of atmospheric composition over the last decade. For instance, relatively localized studies of the mesosphere and lower thermosphere (MLT) region of the Earth’s atmosphere have shown such measurements to be an important indicator of global climate change. Nonetheless, global measurements of key atmospheric species have not been made directly by previous satellite missions. 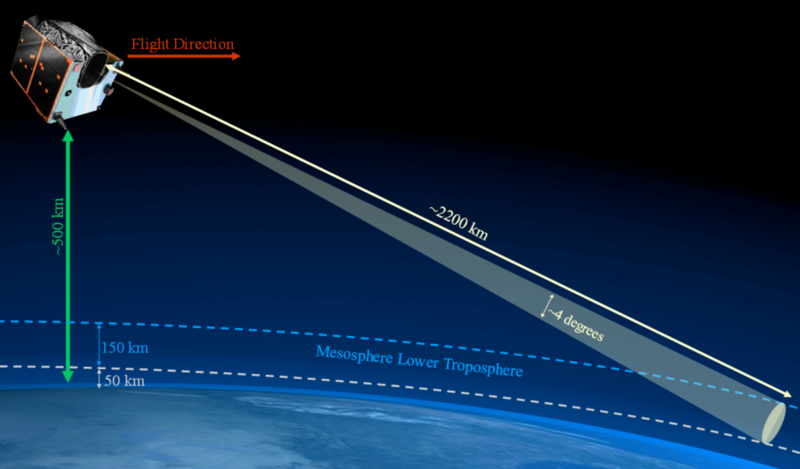 To address this limitation, UK scientists and technologists have developed the concept of a novel and breakthrough limb sounding, multi-channel radiometer operating in the terahertz (THz) spectral range (0.8 – 5 THz) and deployed in low Earth orbit. The radiometer payload will be carried aboard a small UK developed satellite and will allow global high spectral resolution measurements of important MLT atmospheric species, particularly atomic oxygen and the hydroxyl radical. As a direct outcome of previous CEOI-ST support, the UK team has proposed a Low Cost Upper atmosphere Sounder (LOCUS) mission to the European Space Agency (ESA) for study as a candidate in-orbit demonstrator. The mission concept has key objectives of demonstrating breakthrough THz science and technology, and has been accepted for further study by ESA. With the possibility of a space flight demonstration before the end of the current decade, the CEOI-ST is supporting the UK technical team with the advancement of the LOCUS mission concept by addressing key aspects of the payload detector and infrastructure technology. This will raise the instrumentation technical maturity to a level compliant with the in-orbit-demonstration opportunity, and will place the UK in a position of scientific and technical leadership with respect to MLT climate studies. Our specific technical goal is to advance and demonstrate UK THz radiometer and high-speed signal processing technology used in conjunction with a UK developed miniature spaceborne cryogenic system. Our proposed programme is extremely well matched to CEOI-ST strategy. Moreover, it will deliver additional return through future application in a wider range of diverse disciplines including planetary science, astronomy, spectroscopy, security and telecommunications. Illustration of the LOCUS limb-sounding radiometer in operation. To verify payload system performance, reduce the payload power consumption, and demonstrate its compatibility with the environment within which the satellite will operate. This, in turn, will demonstrate the instrument concept, and further enhance the mission and UK position with respect to a competitive future ESA opportunity for in-orbit demonstration. To achieve this objective, our programme of work incorporates the design, construction, and test in a representative thermal environment of an “elegant breadboard” of the LOCUS payload optics and support infrastructure. The optical system is particularly challenging due to the wide wavelength range over which it has to perform (2-375 μm) and the compact nature of the antenna needed to fit into the small satellite concept. Additionally, we are developing a new low-power digital wide band spectrometer (WBS) with power consumption compliant with small satellite deployment. As a final step, we are integrating the breadboard optics and WBS with THz and IR receiver components in order to characterise the full end-to-end performance of the LOCUS payload. Once complete and tested the LOCUS breadboard will be capable of deployment on a balloon or high altitude aircraft to further demonstrate the performance and ground breaking design of the instrument.